The surest way for a clinical trial data collection system to be rewarded by users with accolades like ‘intuitive and user friendly’ is for the system to be flexible-by-design -- that is, to enable users to modify, by design, standard data views to include project-specific data points whenever the user logs in. This juggling act – standard-yet-flexible – is one of the first criterion one should apply when assessing a new system, whether it’s an EDC, CTMS, ePRO or IRT platform under consideration. 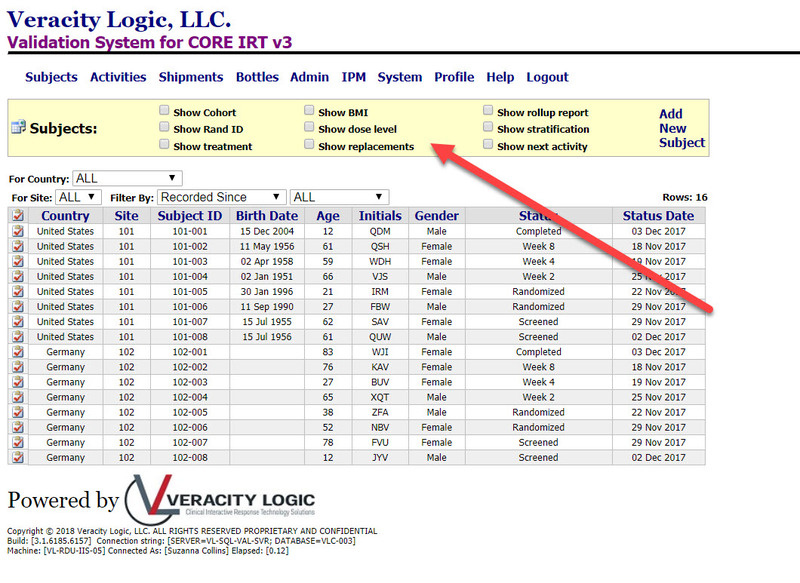 Using the Veracity Logic VLIRT® (IRT/IWR) platform as an example, a system’s architecture becomes ‘intuitive’ when built from the outset to encompass project specific additions to standard views without incurring additional time and costs for custom coding. Modular, configurable flexibility, selected by users at startup, is a key to success. 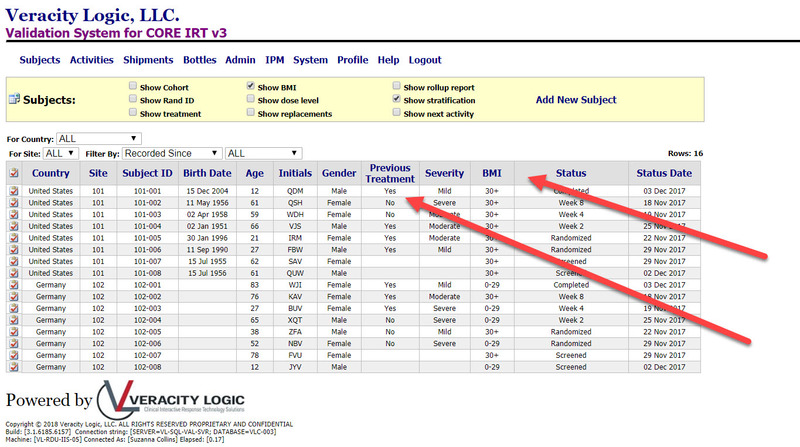 The table view of Subject data seen in the screenshot below is the result of the standard design determined for the project at startup. Note that none of the additional project-specific toggle switches (red arrow) selected for this particular project are yet checked. NOTE: the toggle “Show treatment” is available only to a limited set of unblinded users. In a flexible-by-design system, Project Managers can determine the toggles that will be applied to the study, and which will be offered to each user-type. The latter is accomplished by the application of role -based permissions; these must be modifiable during the study as a simple, no-cost configuration change. The on-demand manipulation of standard views via pre-selected toggles is an elegant way for standard data collection platforms to pack non-standard critical data at-a-glance into intuitive table views.